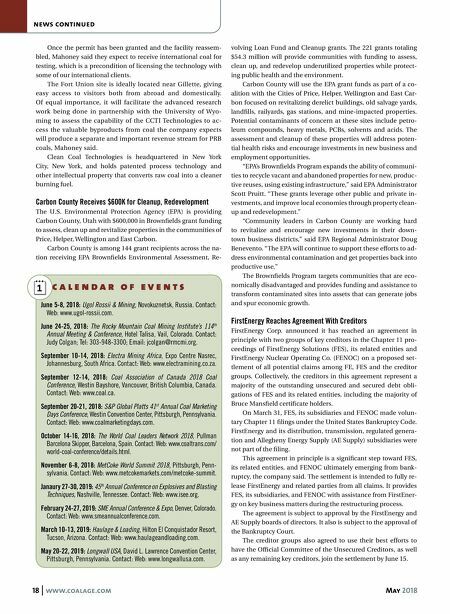 18 www.coalage.com May 2018 news continued Once the permit has been granted and the facility reassem- bled, Mahoney said they expect to receive international coal for testing, which is a precondition of licensing the technology with some of our international clients. The Fort Union site is ideally located near Gillette, giving easy access to visitors both from abroad and domestically. Of equal importance, it will facilitate the advanced research work being done in partnership with the University of Wyo- ming to assess the capability of the CCTI Technologies to ac- cess the valuable byproducts from coal the company expects will produce a separate and important revenue stream for PRB coals, Mahoney said. Clean Coal Technologies is headquartered in New York City, New York, and holds patented process technology and other intellectual property that converts raw coal into a cleaner burning fuel. Carbon County Receives $600K for Cleanup, Redevelopment The U.S. Environmental Protection Agency (EPA) is providing Carbon County, Utah with $600,000 in Brownfields grant funding to assess, clean up and revitalize properties in the communities of Price, Helper, Wellington and East Carbon. Carbon County is among 144 grant recipients across the na- tion receiving EPA Brownfields Environmental Assessment, Re- volving Loan Fund and Cleanup grants. The 221 grants totaling $54.3 million will provide communities with funding to assess, clean up, and redevelop underutilized properties while protect- ing public health and the environment. Carbon County will use the EPA grant funds as part of a co- alition with the Cities of Price, Helper, Wellington and East Car- bon focused on revitalizing derelict buildings, old salvage yards, landfills, railyards, gas stations, and mine-impacted properties. Potential contaminants of concern at these sites include petro- leum compounds, heavy metals, PCBs, solvents and acids. The assessment and cleanup of these properties will address poten- tial health risks and encourage investments in new business and employment opportunities. "EPA's Brownfields Program expands the ability of communi- ties to recycle vacant and abandoned properties for new, produc- tive reuses, using existing infrastructure," said EPA Administrator Scott Pruitt. "These grants leverage other public and private in- vestments, and improve local economies through property clean- up and redevelopment." "Community leaders in Carbon County are working hard to revitalize and encourage new investments in their down- town business districts," said EPA Regional Administrator Doug Benevento. "The EPA will continue to support these efforts to ad- dress environmental contamination and get properties back into productive use." The Brownfields Program targets communities that are eco- nomically disadvantaged and provides funding and assistance to transform contaminated sites into assets that can generate jobs and spur economic growth. FirstEnergy Reaches Agreement With Creditors FirstEnergy Corp. announced it has reached an agreement in principle with two groups of key creditors in the Chapter 11 pro- ceedings of FirstEnergy Solutions (FES), its related entities and FirstEnergy Nuclear Operating Co. (FENOC) on a proposed set- tlement of all potential claims among FE, FES and the creditor groups. Collectively, the creditors in this agreement represent a majority of the outstanding unsecured and secured debt obli- gations of FES and its related entities, including the majority of Bruce Mansfield certificate holders. On March 31, FES, its subsidiaries and FENOC made volun- tary Chapter 11 filings under the United States Bankruptcy Code. FirstEnergy and its distribution, transmission, regulated genera- tion and Allegheny Energy Supply (AE Supply) subsidiaries were not part of the filing. This agreement in principle is a significant step toward FES, its related entities, and FENOC ultimately emerging from bank- ruptcy, the company said. The settlement is intended to fully re- lease FirstEnergy and related parties from all claims. It provides FES, its subsidiaries, and FENOC with assistance from FirstEner- gy on key business matters during the restructuring process. The agreement is subject to approval by the FirstEnergy and AE Supply boards of directors. It also is subject to the approval of the Bankruptcy Court. The creditor groups also agreed to use their best efforts to have the Official Committee of the Unsecured Creditors, as well as any remaining key creditors, join the settlement by June 15. c a l e n d a r o f e v e n t s June 5-8, 2018: Ugol Rossii & Mining, Novokuznetsk, Russia. Contact: Web: www.ugol-rossii.com. 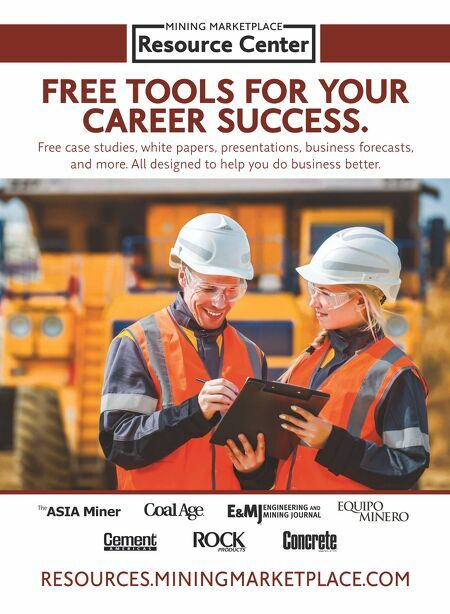 June 24-25, 2018: The Rocky Mountain Coal Mining Institute's 114 th Annual Meeting & Conference, Hotel Talisa, Vail, Colorado. Contact: Judy Colgan; Tel: 303-948-3300; Email: jcolgan@rmcmi.org. September 10-14, 2018: Electra Mining Africa, Expo Centre Nasrec, Johannesburg, South Africa. Contact: Web: www.electramining.co.za. September 12-14, 2018: Coal Association of Canada 2018 Coal Conference, Westin Bayshore, Vancouver, British Columbia, Canada. Contact: Web: www.coal.ca. September 20-21, 2018: S&P Global Platts 41 st Annual Coal Marketing Days Conference, Westin Convention Center, Pittsburgh, Pennsylvania. Contact: Web: www.coalmarketingdays.com. October 14-16, 2018: The World Coal Leaders Network 2018, Pullman Barcelona Skipper, Barcelona, Spain. Contact: Web: www.coaltrans.com/ world-coal-conference/details.html. November 6-8, 2018: MetCoke World Summit 2018, Pittsburgh, Penn- sylvania. Contact: Web: www.metcokemarkets.com/metcoke-summit. Janaury 27-30, 2019: 45 th Annual Conference on Explosives and Blasting Techniques, Nashville, Tennessee. Contact: Web: www.isee.org. February 24-27, 2019: SME Annual Conference & Expo, Denver, Colorado. Contact: Web: www.smeannualconference.com. March 10-13, 2019: Haulage & Loading, Hilton El Conquistador Resort, Tucson, Arizona. Contact: Web: www.haulageandloading.com. May 20-22, 2019: Longwall USA, David L. Lawrence Convention Center, Pittsburgh, Pennsylvania. Contact: Web: www.longwallusa.com.